Deborah Crook’s recommendation: “I recently attended the SXSW Music Festival in Austin, TX, and amid the glut of bands, new, old and just starting, I made time to catch Suzanne Vega, who performed on March 17 at St David’s Historic Sanctuary. I hadn’t actively listened to her in years, but some of her earlier hits were pivotal in my getting the power of a song to convey emotion, redemption and meaning. 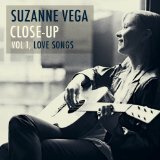 Touring in support of a newly recorded collection of her hits, Suzanne Vega Close-Up, Vol. 1: Love Songs, from more than 25 years of writing and performing, what completely blew me away was how timeless her writing was, and is. And that I knew nearly every word of some of her songs reminded me how influential she was to my life and my own work. I was moved to re-listen to Small Blue Thing again and again, for it’s concision, melody and pure emotional truth. Listen to this singer-songwriter from San Francisco and you’ll hear echos of early Sheryl Crow and Natalie Merchant. She’s becoming a favorite staple at SXSW and is currently on tour to support her new EP, It’s All Up to You. Be sure to check her out.